Richard Tait has questioned whether Gordon Strachan has seen Motherwell's young contingent this season after the former Scotland manager claimed clubs were deluding themselves about the talent coming through. Four Motherwell players started for Scotland Under-21s last week. Strachan said Scotland's "real problem" was its clubs' "selfishness" after a poor start to Euro 2020 qualifying. "Has he been to a Motherwell game?" full-back Tait responded. "I don't know, he obviously hasn't if he's not seen the talent we have got coming through." Midfielders Allan Campbell and David Turnbull have been stand-out performers for the Lanarkshire side this term, while winger Jake Hastie seared on to the scene in January and has produced a stunning run of form. 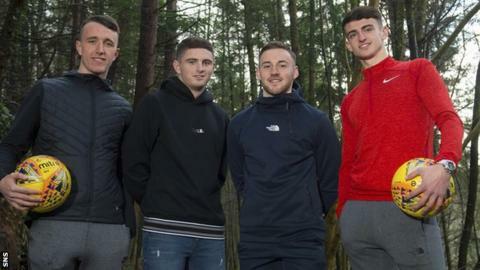 Defender Barry Maguire has been tipped to make his first-team breakthrough next season and his currently on loan at Queen of the South, while academy graduate Chris Cadden has already been capped by his country. Strachan offered his perspective after Scotland began their qualifying campaign with an insipid 3-0 loss to Kazakhstan and a drab 2-0 win over San Marino, the lowest-ranked nation in world football, but Tait insists Motherwell are doing their bit for the future of Scottish football. "It's fantastic that they are all starting for Scotland. It's positive for Motherwell but it's also positive for the future of Scotland as well," the defender added. "Everyone expects to bring through players like Lionel Messi all the time. That's a load of rubbish, the guy is a one-in-a-lifetime kind of player. "David Turnbull is a fantastic football player, Jake Hastie, Allan Campbell, Barry Maguire is out on loan but he is a great player as well. And it's just nice Motherwell have that much young talent coming through."